Cleveland, OH (January 18, 2011) – According to figures released today by the Greater Cleveland Automobile Dealers’ Association (GCADA), for December 2010 v. December 2009, new vehicle car and truck sales increased by 22.35% when removing sales statistics for the discontinued Hummer, Pontiac and Saturn brands. A total of 23 automotive brands registered increases over the monthly period, while new vehicle sales for the year increased 16.43%. Ford continued to lead all automakers in total new vehicle sales in Northern Ohio, followed by Chevrolet, Toyota and Honda. “All market indications and analysts’ predictions point to a strong year for automotive sales in 2011,” says Louis A Vitantonio, Jr. president of the GCADA. “As the economy continues to improve and credit becomes even more available, the numbers are sure to grow. For the third straight month, Chrysler, Dodge and Jeep sales grew by triple digits, when comparing December 2010 against the same month a year prior. For the month, the top three sales leaders in Northern Ohio were Ford, Chevrolet and Toyota, with Ford selling some 2,393 units. Chevrolet came in second with 1,954 units while Toyota’s 1,382 units edged out Honda with 1,355 units. Sales in the luxury segment continued to grow with eight brands registering sales gains when comparing December 2010 vs. December 2009. Infiniti showed the strongest growth among luxury brands locally during the month, registering growth of almost 150 percent in December over the same period a year prior. 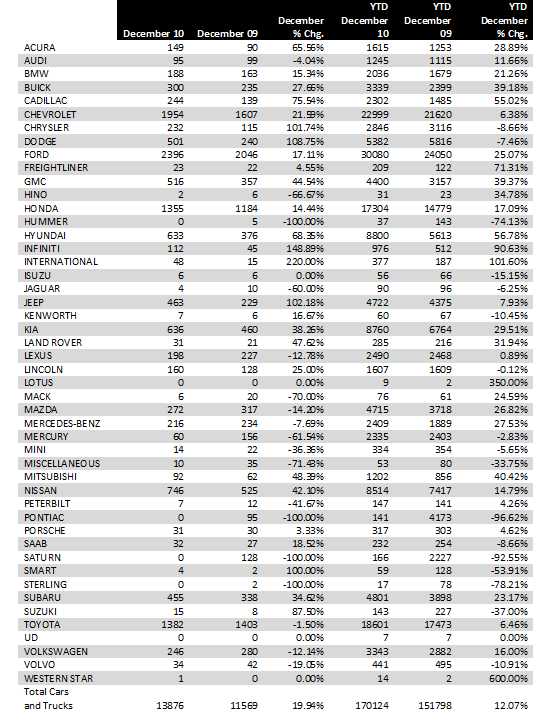 Other luxury brands registering sales increases included: Acura, BMW, Cadillac, Land Rover, Lincoln, Porsche and Saab. For the year, 24 brands were up. While selling the most volume with over 30,000 units, Ford also registered an increase of over 25 percent when comparing 2010 with 2009. Chevy, which sold one unit shy of the 23,000 mark, registered a modest sales gain of over six percent for the year, with sales steadily growing through the last three months to help push the brand over the top. Toyota came in third in terms of total units sold, besting its rival Honda by a margin of 18,601 units to 17,304 units for Honda. The following 23 brands posted sales increases in December 2010 versus December 2009: Acura, BMW, Buick, Cadillac, Chevrolet, Chrysler, Dodge, Ford, GMC, Honda, Hyundai, Infiniti, Jeep, Kia, Land Rover, Lincoln, Mitsubishi, Nissan, Porsche, Saab, Smart, Subaru, and Suzuki. For 2010, 24 brands posted year-to-date sales increases in the region. They are: Acura, Audi, BMW, Buick, Cadillac, Chevrolet, Ford, GMC, Honda, Hyundai, Infiniti, Jeep, Kia, Land Rover, Lexus, Lotus, Mazda, Mercedes-Benz, Mitsubishi, Nissan, Porsche, Subaru, Toyota, and Volkswagen.